The enormous bird wing butterfly has a body mass of 12 g (0.4 oz), while the diminutive pygmy blue is so tiny its weight is estimated to be only 0.003 g (0.0001 oz). The largest butterfly in the world is the QUEEN ALEXANDRA'S BIRDWING (Ornithoptera alexandrae). 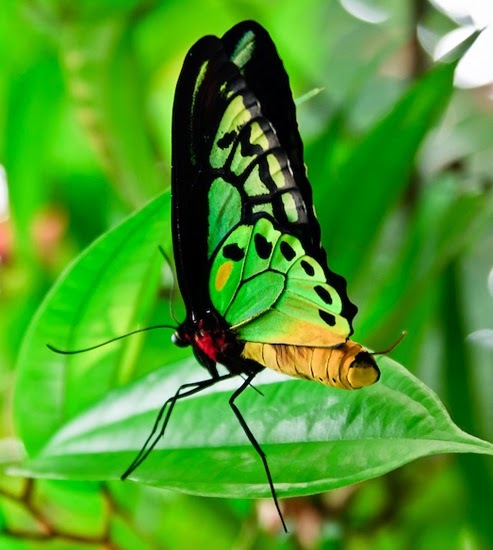 This huge, poisonous butterfly lives in the rain forests of Papua, New Guinea, and is an endangered species with a wing span of 11 inches. Males of the species are much smaller than females.